Attaches mirrors to doors and walls. Attractive design and is easy to use. Mirror Holders come with Hardware and holds mirrors up to 20 lbs. Includes: 4 OOK clear mirror clips, 4 screws, 4 anchors Includes screws and anchors. Will not damage walls. 20 LB hangers contain 5 to a pack. 60 LB hangers contain 3 to a pack. Fits all sizes. Blister pack. For closets, lockers, offices, kitchens, laundry rooms, mud rooms, kids' rooms, dorm rooms, baths, boats and campers. Holds objects such as clothes, rags, cleaning items, etc. Easy and clean removal of adhesive without leaving sticky or oily residue and with no surface damage. Reusable with Command adhesive replacement strips. Each hook holds up to 1/2 pounds. Includes: (6) Hangers, (12) Nails Contains 3 each hanger and eyelets for hanging lightweight frames. For 1/2" mirrors. Includes screws and anchors. holds mirror and glass up to 1/4" thick. Includes anchors and screws. For concrete and brick walls. For concrete and brick walls. For hanging lightweight frames. Just peel and stick. Hand welded brass collar and center of gravity guides, will not damage walls, for sheet rock and plaster walls. Blue steel nails leave a pin size hole on wall surface and are re-usable. For drywall and plaster wall surfaces. Weight ratings are based on hangers nailed into studs and are for comparative purposes only. Choose a weight rating that greatly exceeds the object to be hung. Nails hold up to 30 lbs. load capacity. 1-hole narrow "D" ring for back of frame. Screws included. Hand welded brass collar and center of gravity guides. Will not damage walls. For sheet rock and plaster walls. Includes: 2 hooks and 4 nails. For closets, lockers, offices, kitchens, laundry rooms, mud rooms, kids' rooms, dorm rooms, baths, boats and campers. Holds objects such as clothes, rags, cleaning items, etc. Easy and clean removal of adhesive without leaving sticky or oily residue and with no surface damage. Reusable with Command adhesive replacement strips. Holds up to 5 pounds. Hand welded brass collar and center of gravity guides. Will not damage walls. For sheet rock and plaster walls. Includes: 3 hooks and 3 nails. 15 ft. of invisible wire. Made of nylon filiment. Hand welded brass collar and center of gravity guides. Will not damage walls. For sheet rock and plaster walls. 15 ft. of invisible wire. Made of nylon filiment. Hand welded brass collar and center of gravity guides. Will not damage walls. For sheet rock and plaster walls. For mounting items or for reusing with 3M hooks and picture hangers. Removes cleanly and may be moved and reused repeatedly. 8 small, 4 medium and 4 large strips per pack. Weight Capacity: 1 pound, 3 pounds, 5 pounds. Attractive design is a traditional favorite. Hand welded brass collar and center of gravity guides. Will not damage walls. For sheet rock and plaster walls. Includes: 3 hooks and 3 nails. 2-hole wide "D" ring for back of frame. Includes screws. Includes (28) 3/4" screw eyes, (16) 1" screw hooks, (4) 1" brass coated cup hooks and (7) 1" white cup hooks. For closets, lockers, offices, kitchens, laundry rooms, mud rooms, kids' rooms, dorm rooms, baths, boats and campers. Holds objects such as clothes, rags, cleaning items, etc. Easy and clean removal of adhesive without leaving sticky or oily residue and with no surface damage. Reusable with Command adhesive replacement strips. Each hook holds up to 1 pound. Includes (25) 3/4" square hooks and (12) 7/8", (8) 1" and (5) 1-1/4" round hooks. For closets, lockers, offices, kitchens, laundry rooms, mud rooms, kids' rooms, dorm rooms, baths, boats and campers. Holds objects such as keys, clothes, rags, cleaning items, etc. Easy and clean removal of adhesive without leaving sticky or oily residue and with no surface damage. Reusable with Command Adhesive replacement strips. Holds up to 3 pounds. White hooks and strips included. Mount posters and other flexible objects. Easy to apply with strong holding power. Easy to remove. No adhesive residue or surface damage. Weight capacity: 1 pound. 15 ft. of invisible wire. Made of nylon filiment. Hangs pictures or heavy objects securely. Includes "no drill" anchor. A no surface damage option to organize handled products such as brooms and mops. Each hook holds up to 5 lbs. Holds firmly and removes cleanly. Reusable with Command replacement strips. For mounting items or for reusing with 3M hooks and picture hangers. Removes cleanly and may be moved and reused repeatedly. A no surface damage option to organize handled products such as brooms and mops. Each hook holds up to 3 lbs. Holds firmly and removes cleanly. Reusable with Command replacement strips. For decorating and organizing closets, lockers, offices, kitchens, laundry rooms, mud rooms, kids' rooms, dorm rooms, baths, boats and RVs. When properly removed, they come off cleanly without surface damage and may be relocated and reused with a new Command adhesive strip. Each hook holds up to 3 pounds. Lightweight, low profile adjustable design straps. Wraps onto itself for a secure hold. For all bundling and organizational needs. For indoor or outdoor use. 1-1/4" snaps shut for extra safety. Removable interlocking fasteners with command adhesive hold firmly where placed. Fasteners can be separated and reattached. When removed, they come off cleanly without surface damage. Each set holds up to 1 pound with 4 sets per pack. For lightweight frames. No screws or nails needed. For lightweight frames. No screws or nails needed. Removable interlocking fasteners with command adhesive hold firmly where placed. Fasteners can be separated and reattached. When removed, they come off cleanly without surface damage. Each set holds up to 3 pounds with 3 sets per pack. For closets, lockers, offices, kitchens, laundry rooms, mud rooms, kids' rooms, dorm rooms, baths, boats and campers. Holds objects such as clothes, rags, cleaning items, etc. Easy and clean removal of adhesive without leaving sticky or oily residue and with no surface damage. Reusable with Command adhesive replacement strips. Holds up to 5 pounds. Industrial strength fasteners are excellent for indoor and outdoor use where extra holding power is needed. Sticks to most surfaces, including plastic. Fasteners are water resistant and perform well over a broad temperature range. Note: Not for use on flexible vinyl surfaces such as car dashboards and vinyl consoles. Each package contains 2 sets of hooks and loops. Industrial strength fasteners are excellent for indoor and outdoor use where extra holding power is needed. Sticks to most surfaces, including plastic. Fasteners are water resistant and perform well over a broad temperature range. Note: Not for use on flexible vinyl surfaces such as car dashboards and vinyl consoles. Each package contains 2 sets of hooks and loops. Water-resistant. For decorating and organizing closets, lockers, offices, kitchens, laundry rooms, mud rooms, kids' rooms, dorm rooms, baths, boats and RVs. When properly removed, they come off cleanly without surface damage and may be relocated and reused with a new Command adhesive strip. Each hook holds up to 5 pounds. 30 pound professional picture hanger included. For mounting items or for reusing with 3M hooks and picture hangers. Removes cleanly and may be moved and reused repeatedly. For mounting items or for reusing with 3M hooks and picture hangers. Removes cleanly and may be moved and reused repeatedly. 8 small, 4 medium and 4 large strips per pack. Weight Capacity: 1 pound, 3 pounds, 5 pounds. Strip holds strongly on a variety of surfaces, including paint, wood, tile and more. Removes cleanly - no holes, marks, or sticky residue. Weight Capacity: 2 Pounds. Holds firmly, until you want to take it down. Removes cleanly. Reusable hanger. When properly removed, they come off cleanly without surface damage and may be relocated and reused with a new Command adhesive strip. Holds up to 5 pounds. White hooks and strips included. Holds firmly, until you want to take it down. Use with wire backed picture hangers. Removes cleanly. Reusable hanger. When properly removed, they come off cleanly without surface damage and may be relocated and reused with a new Command adhesive strip. Holds up to 5 pounds. 1-1/4" snaps shut for extra safety. Designed for use with drywall. Feature steel construction and 75 lb maximum weight capacity, steel construction, hardware included, no drilling required. Hangs three pictures. Kit includes: wire, eye hooks, wall hangers and nails. Carded. Damage-free hanging. For hanging photos, memos, schedules & pictures without frames. Holds strongly to wood, tile, metal and painted surface. Remove cleanly, leaving behind no holes, marks, sticky residue or stains. Ideal for concrete and brick walls. Included brass-plated, bendless masonry nails have special finishing tips that easily penetrate hard wall surfaces. Steel construction. 30 pound professional picture hanger included. Press-on fasteners are for smooth surfaces such as painted wallboard, glass, metal and most plastics. For small jobs, crafts, remote controls, etc. Press-on fasteners are for smooth surfaces such as painted wallboard, glass, metal and most plastics. For small jobs, crafts, remote controls, etc. Press-on fasteners for smooth surfaces such as painted wallboard, glass, metal and most plastics. Mount items without making holes in wall. Press-on fasteners for smooth surfaces such as painted wallboard, glass, metal and most plastics. Mount items without making holes in wall. Press-on fasteners for smooth surfaces such as painted wallboard, glass, metal and most plastics. Mount items without making holes in wall. Ideal for concrete and brick walls. Included brass-plated, bendless masonry nails have special finishing tips that easily penetrate hard wall surfaces. Steel construction. Damage-free hanging, holds strongly, removes cleanly, no nail holes. Holds up to 1 pound. Contains 20 strips per pack. Hang up to 4 pictures and holds 10-30 lbs. Includes 2- 10lb and 2- 30lb conventional picture hooks and nails, 10 screw eyes, and 9 ft of picture wire. Brushed stainless steel. Carded. Clear hooks blend into high-visibility surfaces so they don't distract from your decor. Hold firmly and remove cleanly without causing damage to the surfaces. Each hook holds up to 1 pound. With zinc plated nails. Holds strongly, but can be removed cleanly and without surface damage. Ideal for various kitchen utensils. Reusable with Command replacement strips. Each hook holds up to 1/2 pounds. For closets, lockers, offices, kitchens, laundry rooms, mud rooms, kids' rooms, dorm rooms, baths, boats and campers. Holds objects such as clothes, rags, cleaning items, etc. Easy and clean removal of adhesive without leaving sticky or oily residue and with no surface damage. Reusable with Command adhesive replacement strips. Each hook holds up to 1/2 pounds. Press-on fasteners are for smooth surfaces such as painted wallboard, glass, metal and most plastics. For larger jobs, message boards, holiday decorations. Press-on fasteners are for smooth surfaces such as painted wallboard, glass, metal and most plastics. For larger jobs, message boards, holiday decorations. Press-on fasteners are for smooth surfaces such as painted wallboard, glass, metal and most plastics. For larger jobs, message boards, holiday decorations. Press-on fasteners are for smooth surfaces such as painted wallboard, glass, metal and most plastics. For small jobs, crafts, remote controls, etc. For frames, mirrors, and cabinets. Includes 2 hangers and 4 screws per card. Translucent, for indoor and outdoor use, water resistant, and adheres to most surfaces, including glass. Peel tape from fastener and press firmly onto a clean, dry surface. Adhesive reaches maximum strength after 24 hours. Not recommended for fabrics, sewing, dashboards, flexible vinyl, or underwater use. Continued exposure to full sunlight can damage fastener. Ideal to secure and organize multiple cords, cables or other large-diameter cords. Holds strong, but removes cleanly without damaging the surface. Can be reapplied by using a new Command adhesive strip. Clip holds cord diameter up to .5 inches. Includes 20 screw eyes, 10 conventional picture hooks and 17 nails, 2 saw tooth hangers and 1 coil of picture wire. Will not damage walls. Use on back of frame. Will not bend when hammered. Ook Mirror Hanging Cord, 9 ft Length, 20 lb Load Capacity, Stainless Steel, For Indoors and Outdoors Applications to Securely Hang Mirrors 30 pound professional picture hanger included. Ideal for concrete and brick walls. Included brass-plated, bendless masonry nails have special finishing tips that easily penetrate hard wall surfaces. Steel construction. No more, tangled cords behind your computers, appliances and entertainment centers. Perfect for work and home offices, as well as entertainment areas, keep cords organized and safely out of the way. Holds strongly on a variety of surfaces, including paint, wood, tile and more. Removes off cleanly - no holes, marks, sticky residue or stains. Holds firmly, removes cleanly. Reusable clip. Will not slip like magnetic clips. No surface damage. 9 ft. kink resistant, soft and flexible. For decorating and organizing closets, lockers, offices, kitchens, laundry rooms, mud rooms, kids' rooms, dorm rooms, baths, boats and RVs. When properly removed, they come off cleanly without surface damage and may be relocated and reused with a new Command adhesive strip. Each hook holds up to 3 pounds. For decorating and organizing closets, lockers, offices, kitchens, laundry rooms, mud rooms, kids' rooms, dorm rooms, baths, boats and RVs. When properly removed, they come off cleanly without surface damage and may be relocated and reused with a new Command adhesive strip. Each hook holds up to 3 pounds. Kid safe. Good for earthquake prone areas. Kid safe. Good for earthquake prone areas. Water-resistant. For decorating and organizing closets, lockers, offices, kitchens, laundry rooms, mud rooms, kids' rooms, dorm rooms, baths, boats and RVs. When properly removed, they come off cleanly without surface damage and may be relocated and reused with a new Command adhesive strip. Each hook holds up to 5 pounds. Organize cords behind computers, appliances and entertainment centers. They remove cleanly and may be reused with a new Command adhesive strip. Holds a bundle of wires up to 3 pounds and 1-1/4 inches in diameter. Pack contains 2 bundlers and 3 strips. Damage-free hanging, holds strongly, removes cleanly, no surface damage. Removable interlocking fasteners with command adhesive hold firmly where placed. Fasteners can be separated and reattached. When removed, they come off cleanly without surface damage. Each set holds up to 3 pounds with 3 sets per pack. Removable interlocking fasteners with command adhesive hold firmly where placed. Fasteners can be separated and reattached. When removed, they come off cleanly without surface damage. Each set holds up to 3 pounds with 3 sets per pack. 9 ft, durasteel stainless steel hanging wire. 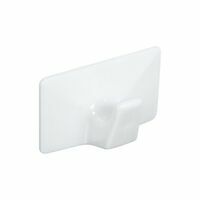 Damage-free hanging, holds strongly, removes cleanly, no surface damage. Damage-free hanging, holds strongly, removes cleanly, no surface damage. Damage-free hanging. For hanging photos, memos, schedules & pictures without frames. Holds strongly to wood, tile, metal and painted surface. Remove cleanly, leaving behind no holes, marks, sticky residue or stains. Contains: 1 hanger, 4 large strips and 2 sets of mini strips. Holds up to 8 pounds. For decorating and organizing closets, lockers, offices, kitchens, laundry rooms, mud rooms, kids' rooms, dorm rooms, baths, boats and RVs. When properly removed, they come off cleanly without surface damage and may be relocated and reused with a new Command adhesive strip. Holds up to 9 pounds. Industrial strength fasteners are excellent for indoor and outdoor use where extra holding power is needed. Sticks to most surfaces, including plastic. Fasteners are water resistant and perform well over a broad temperature range. Note: Not for use on flexible vinyl surfaces such as car dashboards and vinyl consoles. Industrial strength fasteners are excellent for indoor and outdoor use where extra holding power is needed. Sticks to most surfaces, including plastic. Fasteners are water resistant and perform well over a broad temperature range. Note: Not for use on flexible vinyl surfaces such as car dashboards and vinyl consoles. Hold things securely in place, both outdoors and in with these press-on fasteners. 9 ft. durasteel wire with a plastic coating. Coating protects your hands and fingers from injury and re-enforces the wire for extra holding power. Heavy-duty for bundling, securing, and cinching. Adjustable. For indoor/outdoor use. Contains: Two straps. No tools required for this popular picture hook. Just push into the drywall with the point of the hook and push. Holds up to 35 pounds, re-usable. Includes: 5 hangers. Accent metallic coated. 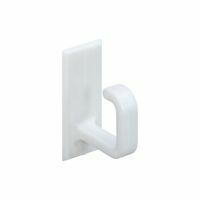 Damage-free hanging, holds strongly, removes cleanly, no nail holes. Padded back protects walls. For sheet rock and plaster walls. Hands free hammering. Repositionable adhesive. 9 ft, durasteel stainless steel hanging wire. 9 ft, durasteel stainless steel hanging wire. Hangs 5 pictures, position hanger on back of frame and gently tap nails in. Kit comes with all hardware needed to hang several frames. Hands free hammering, no holding or fussing with nails. Frame back for frames that do not already come with hanging hardware, for wooden frames only, conventional hangers hold up to 30 pounds. Ideal for drywall/plaster wall surfaces. Accent metallic coated. Damage-free hanging, holds strongly, removes cleanly, no nail holes. Pro hanger uses case hardened, blue steel nails with brass collar for reuse, special center of gravity nail guides eliminates "play" in the wall, re-enforced elbow for added security. Incudes 30lb wire and ring hangers. Pro hanger uses case hardened, blue steel nails with brass collar for re-use, special center of gravity nail guides eliminates "play" in the wall, reinforced elbow for added security. Includes (2) 50 lb. Pro Hangers and (2) D Ring Hangers. General purpose ties are perfect for controlling and organizing wires, cords, and cables and for bundling a wide range of materials-from flowers to tools. Adjustable ties are strong, reusable, and designed for heavier-duty indoor or outdoor use. Provide organization without wall-damaging nails, screws, tacks or permanent adhesives. Hold strongly on a variety of surfaces, including painted surfaces, wood, tile, metal and more. Comes off cleanly - no holes, marks, sticky residue or stains. Contents: 1 caddy, 2 strips. Provide organization without wall-damaging nails, screws, tacks or permanent adhesives. Hold strongly on a variety of surfaces, including painted surfaces, wood, tile, metal and more. Comes off cleanly - no holes, marks, sticky residue or stains. Contents: 1 caddy, 2 strips. Designed for hanging home and industrial products. Sharp screw point bites into wood easily and quickly. Bagged. Designed for hanging home and industrial products. Sharp screw point bites into wood easily and quickly. Bagged. Damage-free hanging, holds strongly, removes cleanly, no nail holes. Accent metallic coated. Damage-free hanging, holds strongly, removes cleanly, no nail holes. Accent metallic coated. Damage-free hanging, holds strongly, removes cleanly, no nail holes. Midwest Picture Hanging Kit, Assorted, 61 Pieces 6 Military multi-color ties.